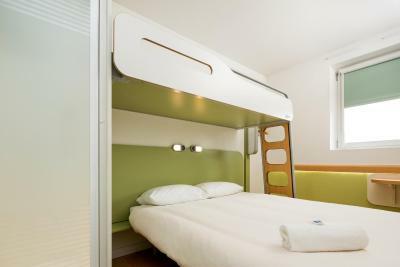 Lock in a great price for ibis budget Hotel Edinburgh Park – rated 8 by recent guests! Very good option if you're looking something budget close to the airport! 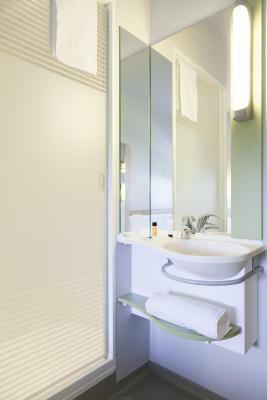 Compact room for 3 people and good location near to tram station to the city. As regards value for money the breakfast was first class. Breakfast was good and it wasn’t too far from the airport. The staff was friendly and helpful. Room compact and ideal for a solo traveller - I was in what appeared to be a triple with a bunk over the main bed. Room was clean and comfortable for the short time I was there (airport stayover.) Heating/air con in the room was great as air vents made the room cold. Breakfast was basic continental but only £5.20 for all you could eat. 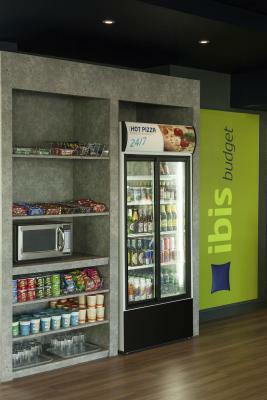 Ibis Budget was great value for the money. 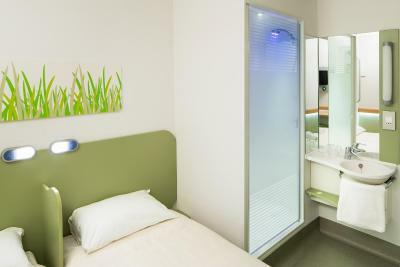 Clean rooms, no frills, and just a couple miles away from the airport, it'd be perfect for anyone catching a super early flight out of EDI. 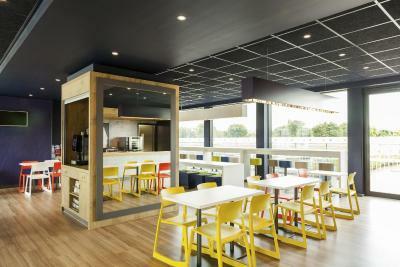 ibis budget Hotel Edinburgh Park This rating is a reflection of how the property compares to the industry standard when it comes to price, facilities and services available. It's based on a self-evaluation by the property. Use this rating to help choose your stay! One of our best sellers in Edinburgh! 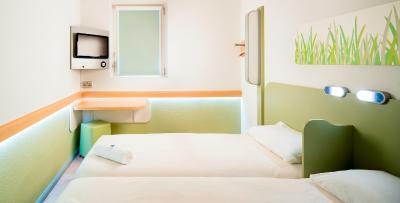 An 8-minute drive from Edinburgh Airport, ibis Budget Hotel Edinburgh Park lies just off the City of Edinburgh Bypass and 30 minutes’ walk from Edinburgh Park Train Station. The Gyle Center Tram Stop is located just opposite the hotel and leads to Edinburgh Airport and city center. 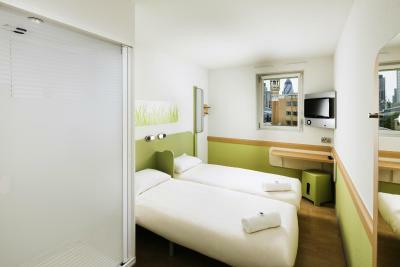 This ibis hotel offers free parking and free WiFi throughout. 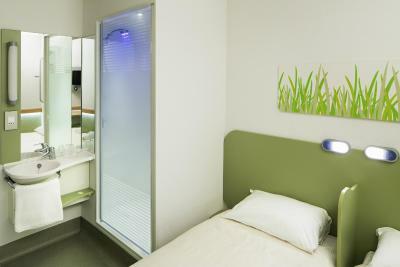 Each air-conditioned room has a flat-screen TV and en suite shower. 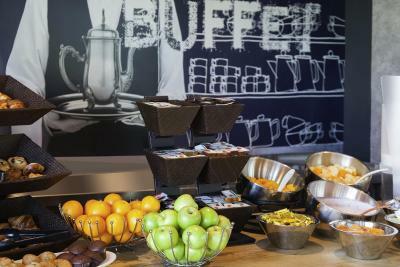 A continental breakfast buffet is available to guests at ibis Budget Hotel Edinburgh Park. Vending machines with drinks and snacks are available at all times. Edinburgh Park provides direct rail services to the city center in around 7 minutes. It is 20 minutes' walk to Edinburgh Gateway rail station, which offers connections to London. Edinburgh Zoo is an 8-minute drive away, and Edinburgh Castle is around 20 minutes from this hotel. 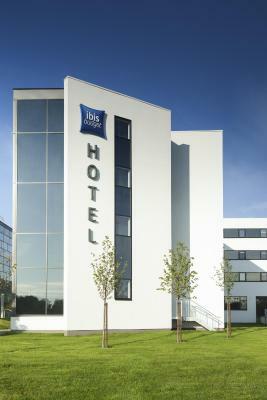 When would you like to stay at ibis budget Hotel Edinburgh Park? 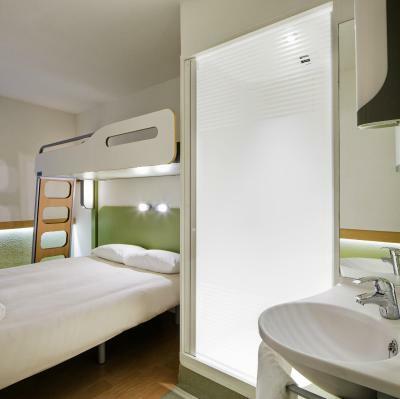 This room has a private shower, flat-screen TV and free Wi-Fi. Get into a cosy bed without getting out of your budget! Renovated bedrooms with a cozy bed, a soft duvet, spacious shower… and all you can eat breakfast buffet. 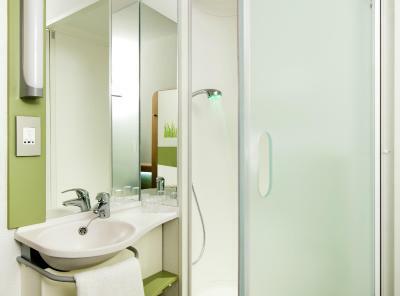 House Rules ibis budget Hotel Edinburgh Park takes special requests – add in the next step! ibis budget Hotel Edinburgh Park accepts these cards and reserves the right to temporarily hold an amount prior to arrival. When paying by cash, guests will be asked to provide proof of ID as a guarantee (valid passport or driving license are accepted). Breakfast options weren't great as things were running out quicker than it was being made or not being stocked up. The lifts weren't working on the evening and the morning of the stay. The keyless entrance wasn't working which meant every time we went out of our rooms staff had to let us back in. The towels were not ready and it was promised to be delivered to our room which they didn't. Picked up our towels at 11:30 pm after we came back from our dinner. Staff was quite apologetic about the issues we were facing but the overall experience didn't improve. 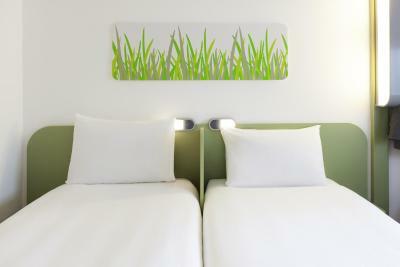 The hotel is situated close to the motorway which made it easier to go to the city easily. Room was a little bit on the small side. No tea making facilities. No big deal! The variety was good and excellent value. Access to tram/airport. Very comfortable for an overnight stay. Excellent value for money. Helpful, friendly staff. Some rooms look over very busy intersections - if you like to sleep with an open window (like us), the noise in the morning will wake you up. Best to confirm at the time of checking in. The breakfast menu is very good, although the choice is somewhat limited for latecomers. The room layout is very efficient, e.g. not much space to move around, but comfortable for 2 people. Bed - very good. Staff at reception - kind and helpful. excellent value for money. 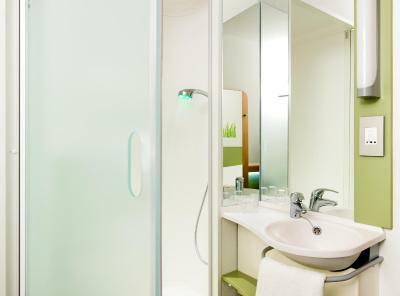 This hotel is basic, it’s a bit like a dorm room, very small sink, good size shower, but the toilet door does not go to the ceiling or the floor, which put me off and I was travelling with my husband.....there are no kettles in the rooms tea & coffee is free but it’s in the cafe/reception area. If you want comfort and space, carpets in the room & more than a tiny square of soap, pay the extra 4 or 5 pounds a night for the premier or Novotel. This hotel had the feeling of a good upmarket hostel, great for a 1 night stop over, or if you have an early flight to catch. You do get what you pay for in the cheap pricing, I paid £39 for a Sunday, I wouldn’t say it was worth more than that. 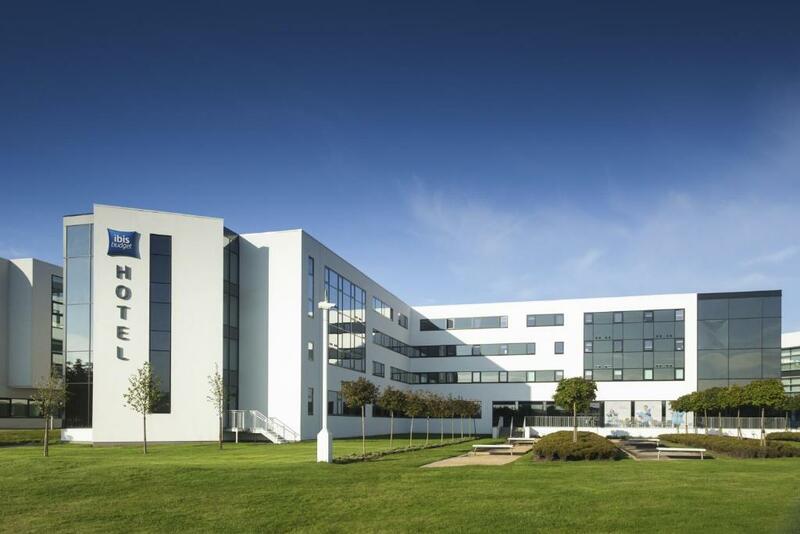 The location of this hotel, just off the Edinburgh city bypass at The Gyle centre is great to get to and leave from as it has access to all the major routes in & out of Edinburgh. It is also right at the Tram Stop which will take you to the airport or the centre of Edinburgh in no time. The rooms & the hotel it’s self are very clean. And the staff were helpful. Proximity to airport. Staff super friendly and helpful. Cold drink available even with late arrival. Speedy check in. Everything was fine. Just wasn’t in the room cattle for cofe , shampoo , body wash.
Small breakfast. Little bit chaotic. Unpretentious, very comfortable and convenient. Really clean and friendly staff. A fantastic location as just opposite the tram which gets you all around Edinburgh. Having the Morrison’s opposite was good for anything basic we needed. Limited parking. No drop off close to doors. Rooms are so small nowhere to put anything. Can’t charge to room. Food was not available to guests one night because of area being used for large group; they got food, we didn’t. Gave us different room than we booked. Staff were unaccommodating except for the night guy with beard and shaved head. Only one elevator was in service; at one point no elevators in service. Overall this place is not worth what you pay for unless you’re looking for a big disappointment. Only one lift working and no stairs. Keys would not work for the first day but the staff were brilliant. Staff were excellent, very helpful and friendly.